Over-see are presently managing this new build for a one-off residential property in Upton St Leonards, Gloucestershire and have been contracted to work on this from concept to completion. The design includes an underground concrete basement with single storey structural insulated panel (SIP) building above. Sedum roof, zinc cladding and anodised aluminium windows and doors. Work started in the ground in June 2017 and is due for completion in April / May 2018. Please come back to see how we are getting on as we will keep you updated with our time lapse video. Challenges: co-ordinating offsite production of the main elements of the structure, the basement and the sip ground floor structure. 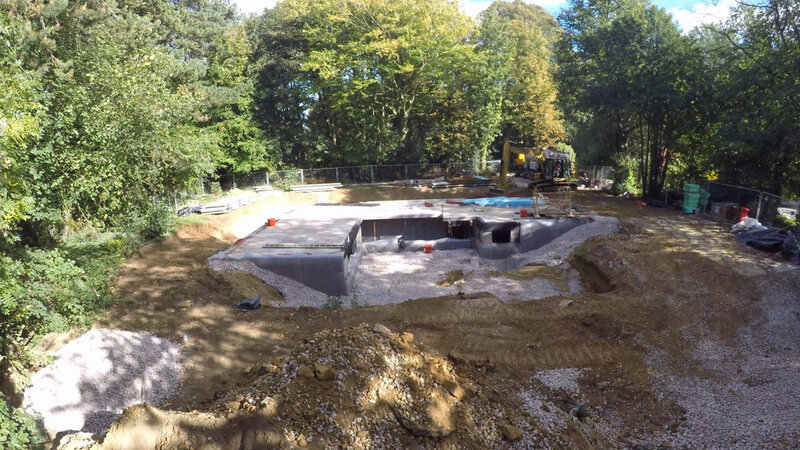 In additional to our contracted services Over-see have been involved with a lot of the design making decisions during the build where the project information either has not been finalised, or not there, which is often the case with many projects. Other challenges include filling in the gaps between the various trades, so each element of work can be carried out successfully.